Join Us ​For Our Sixth Annual Falcon Fest! Sunday, November 4 | 1:00 - 4:00 p.m. 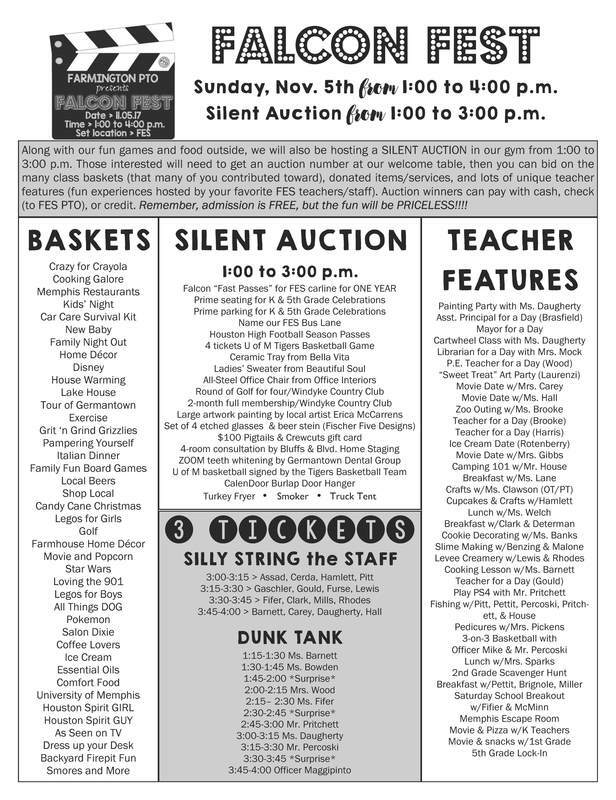 Please note that the silent auction runs from 1:00 to 3:00 p.m.
​Weather is looking great for a Hollywood-style Falcon Fest! Join us Sunday at FES from 1:00 to 4:00 p.m. Tickets will be $1 each, and you will need them for the items listed below. ​your own schedule for the day! FALCON FEST TICKET PRE-SALE IN THE LOBBY THIS WEEK! Admission to our carnival is free, but you will need TICKETS to do many of the activities and purchase food. To skip the lines at the ticket tent next Sunday, you can purchase tickets in advance. . .and even save money while doing it! WALK-TO-SCHOOL-WEDESNDAY: Walk to school with your child and come into the lobby to purchase tickets! * Cash or check to FES PTO will be accepted. Many of our room parents have been working hard gathering items for themed gift baskets to be auctioned in our Falcon Fest silent auction. Thank you to each one of you who donated and helped gather items. These baskets will be auctioned with many other items that our Falcon Fest auction volunteers have collected from our community. Watch this week's Wednesday folder for a complete list of all items available to bid on that day! 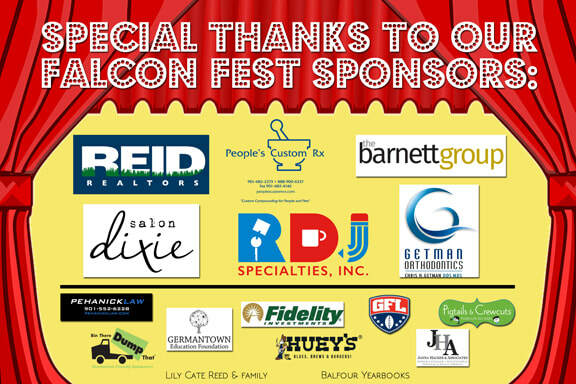 If you have ever been to Falcon Fest, you know that it is a huge event and lots of fun! We need lots of SUPER STAR volunteers to help make this event spectacular! Please consider volunteering to sell food/drinks, monitor our auction, encourage participants at our *new* Karaoke station, and more. If you cannot attend but can send item donations, please check out what we need for Falcon Fest. You can sign up to volunteer your time or items by clicking here. FALCON FEST T-SHIRT DAY FRIDAY, NOV 3. If you purchased a Falcon Fest t-shirt, they are scheduled for delivery to the school on Wednesday. Our volunteers will get them distributed by end of the day on Thursday. We want everyone to wear those shirts on FALCON FEST SHIRT DAY: Friday, November 3. Students may wear their 2017 Falcon Fest shirts with any pants, shorts, or skirt of their choosing (like Spirit Days). Let's show our Falcon Fest spirit! Questions? Send an email to the people in charge of the event!